Totally renovated and redesigned in 2015, the trendy Renaissance Wien combines Viennese tradition and modern style elements. Free WiFi is provided throughout the building, and the Meidlinger Hauptstraße Underground Stop (line U4) is just 100 metres away. The elegant rooms and suites feature luxurious bedding, a bathroom with rain shower, and complimentary tea and coffee making facilities. The suites and club rooms furthermore come with a Nespresso coffee machine. 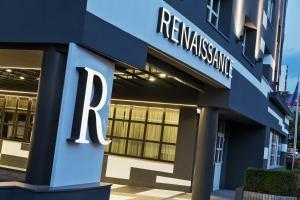 Renaissance Wien Hotel furthermore offers underground parking spaces, modern function rooms for meetings or weddings, and a 200 m² spa area including a sauna, a salt room, a relaxation room with a balcony and an air-conditioned fitness area. International cuisine can be enjoyed at the new and innovative restaurant, and cocktails are served at the on-site bar and lounge. Events are held there on a regularly basis. The city centre and well-known sights such as Naschmarkt or Vienna State Opera can be easily reached by public transport. Schönnbrunn Palace is within 1 underground stop or a 15-minute walk.